Since coming to office, U.S. President Donald Trump has made no bones about his desire to comprehensively refashion Washington’s trade deals. 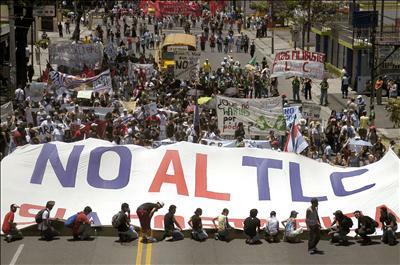 But while more prominent deals such as the North American Free Trade Agreement (NAFTA) have grabbed the most attention, a pact that brings together the United States and some Central American countries and the Dominican Republic has largely flown under the radar. Recent rumblings from Central America and U.S. lobbyists, however, suggest that the Central American-Dominican Republic Free Trade Agreement (CAFTA-DR) ultimately may end up in the Trump administration’s sights. The U.S. government’s preoccupation with other trade deals might preclude any move by Washington to alter CAFTA-DR before Trump’s current tenure ends, but the administration could open talks on the pact, pursuing both changes to trade and demanding that area countries enact more robust security measures. CAFTA-DR, which entered into force in 2004, permits Guatemala, El Salvador, Honduras, Costa Rica, Nicaragua, and the Dominican Republic to export a variety of products to the United States at reduced tariff rates, providing a significant boost to these countries’ meager export profiles. During the mid-2000s, CAFTA-DR helped Honduran, Salvadoran and Nicaraguan textiles become more competitive in the United States, even as Central American textile manufacturers faced an onslaught from Chinese competitors. But likely because of the small trade figures involved (all together, CAFTA-DR’s members export around $25 billion every year to the United States), the deal avoided initial scrutiny from the Trump administration as Washington sought to renegotiate more prominent pacts. Reports from Central America, however, suggest the deal could soon attract greater attention from Washington’s trade regulators. The Honduran newspaper El Heraldo reported on Feb. 6 that members of the U.S. lobbying firm Avenue Strategies visited Tegucigalpa to meet the Honduran Council of Private Businesses to discuss the possibility that Washington will seek to renegotiate CAFTA-DR after the United States concludes talks on NAFTA and addresses perceived imbalances in trade with China. The view is also shared by Nicaraguan Association of Producers and Exporters President Mario Arana, who cited U.S. government trade sources in noting that a renegotiation of CAFTA-DR was plausible after a resolution on NAFTA, Nicaraguan newspaper La Prensa reported Jan. 26. The Trump administration has yet to issue a clear indication that it will reopen the terms of CAFTA-DR, but the matter could soon become a matter of concern for Central American governments and the Dominican Republic. For the past year, Washington’s overriding trade focus has been to overturn U.S. deficits in its global dealings. Apart from Nicaragua, however, the United States enjoys a significant trade surplus with all members of CAFTA-DR. Historically, Central American countries have been heavily dependent on the United States in their trade deals — with CAFTA-DR just the latest chapter in these countries’ long history of economic reliance on their giant northern neighbor. CAFTA-DR members like Honduras, Guatemala and El Salvador are mostly agricultural producers that export few high-value goods and which must procure many of their technologically complex, expensive imports such as automobiles, gasoline, diesel and electrical generators from the United States. Thanks to its trade surplus with Central America, the United States has no need to renegotiate CAFTA-DR to level the playing field for U.S. exporters. Washington, however, could push to alter other aspects of the pact, demanding enhanced trade opportunities for U.S. companies, tighter safeguards for intellectual property rights and increased digital trade between the United States and the region. Unlike the current revisitation of NAFTA, a renegotiation of CAFTA-DR will likely focus on securing additional trade gains for the United States through the modification of the agreement’s fine print. If it chooses to pursue renegotiations, the Trump administration will likely press for changes to specific aspects of the agreement with the intent of expanding trade opportunities and tightening regulatory standards through actions such as the insertion of stricter anti-corruption agreements. But aside from changes to modernize CAFTA-DR, one issue is likely to dominate relations between Washington and its neighbors to the south — especially Honduras, Guatemala and El Salvador — in the years to come: security. The White House has focused heavily on restricting immigration, both illegal and legal, and Central America’s role as a key source of illegal migration to the United States is expected to elicit U.S. pressure to stem the flow of migrants. As a result, any strategy to renegotiate CAFTA-DR will almost certainly include U.S. attempts to act against illegal immigration and drug trafficking through Central America. The administration of former U.S. President Barack Obama focused on the problem of illegal migration from Central America by closely cooperating with Mexico to tighten security along the Mexican-Guatemalan border. As part of the program, which became more robust in 2013, Mexican authorities deployed additional police and military forces in Chiapas and established more checkpoints along routes known to be used by migrants bound for the United States. The Trump administration likely will lean on Honduras, Guatemala and El Salvador to conduct more domestic operations regarding security issues that interest Washington, such as drug trafficking, criminal gangs and illicit migration. Because of the vast differences in power, the United States would prevail in any eventual renegotiations as it can exercise significant pressure on CAFTA-DR member states to accept its demands. Central American countries depend heavily on the United States not only for trade but also for remittances from their citizens working in the country. Unlike Mexico, Central America’s governments wield few weapons with which they could resist have few weapons they could wield against U.S. demands without jeopardizing their own internal stability. 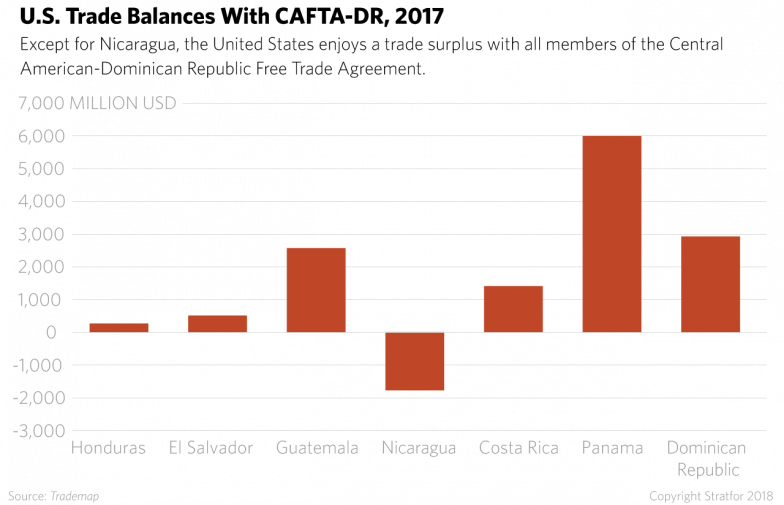 Though Central American countries could impose much higher tariffs on agricultural products, it would be difficult for them to do so without affecting food prices. And while Mexico could also take advantage of bilateral trade deals with South American agricultural producers to quickly replace U.S. imports in any trade war with Washington, most Central American states boast no such luxury. The shape that trade and security efforts ultimately take, however, will depend greatly on whether Trump wins another term in office in 2020. His administration simply may not have enough time to renegotiate CAFTA-DR and push for tighter security in Central America. NAFTA talks could extend into 2019, and the approval of any final deal could ignite political controversy in Canada, Mexico or even the United States, potentially sapping Washington’s desire to overhaul similar deals. The Trump administration may run out of time to determine what it wants from CAFTA-DR talks and launch the process of negotiating and implementing any concessions achieved in such negotiations. But if Trump wins a second term, there is an increased likelihood of renegotiations on CAFTA-DR. The White House appears to be leaning toward changing its trade pact with Central America and the Dominican Republic, but more pressing trade priorities have left CAFTA-DR on the back burner for now. Still, if renegotiations do begin, the issue of security is likely to accompany them. And given the cards the United States holds in its relationship with Central American states, Washington is almost certain to impose whatever it desires on its smaller southern neighbors.